Driver’s Education Online is an easy and convenient way to complete the 30 hrs Requirements. Only 11 Chapters, the last one is the Final on the previous 10 Chapters. Welcome to Online Drivers Ed by South Bay Driving School. Our drivers education program is all online, so as long as you have an internet connection you can take the course anytime, anywhere. Our Online Drivers Ed is the most convenient way to learn the rules to get you on the road. Alternatively you are always welcome to visit our classrooms at South Bay Driving School. 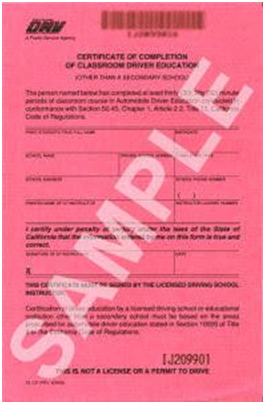 Drivers Ed is a 30 hour course as outlined and approved by the California Department of Motor Vehicles. Information in this course will assist the reader in gathering adequate information in order to pass the written DMV test . It is very easy to use. You simply log into the web site and enroll or you can call us and register on the phone and begin immediately! When you register, you can choose your own password and username and gain access to the course. The course is divided into 11 chapters, with video interaction and video clips throughout. Once you finish each chapter you will have a short quiz to test your knowledge. You must get a mandatory 75% to move to the next chapter. When you pass the quiz you will able to save your score. If you missed too many questions, you will be able to go back and read over the material and retake the quiz. The computer will grade the tests and you will know immediately if you have passed.